CINCINNATI (AP) — The family of a slain Iraqi war veteran wants her towering SpongeBob SquarePants headstone returned to her final resting place while the cemetery officials that removed it say that's the only thing they won't do, leaving both sides at an apparent impasse that may have to be decided in court. Deborah Walker told The Associated Press after Tuesday's meeting with Spring Grove Cemetery officials that she'd consider their various proposals if they would think about hers — simply putting her daughter Kimberly's gravestone back. But cemetery President Gary Freytag told the AP that isn't an option. The headstone fashioned in the cartoon character's likeness was erected at Spring Grove Cemetery on Oct. 10, almost eight months after Kimberly Walker, 28, was found slain in a Colorado hotel room. 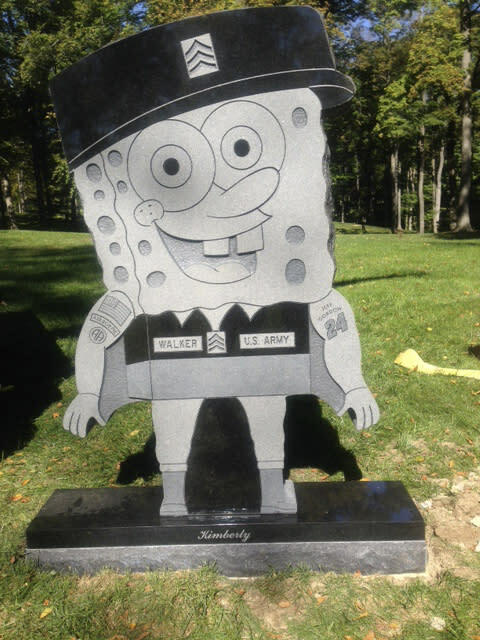 Despite getting the cemetery's prior approval of the headstone design — a smiling SpongeBob in an Army uniform, with Walker's name and rank — cemetery staff called her family the day after it was installed to say it would have to come down. Cemetery officials said the employee who approved the design made a mistake. It was taken down along with a near-exact duplicate erected for Walker's living twin sister. Deborah Walker said she's beyond frustrated with Spring Grove, saying her family had a contract, wants it to be honored as promised and is now considering their legal options. "You can't keep blaming it on an employee," she said. "That employee represented that whole cemetery and when they do wrong, you've got to make it right. Put SpongeBob back up." Freytag said he's "willing to do whatever the family thinks is best, other than installing the monuments back as they were." Other possible solutions, Freytag said, include creating new, more traditional headstones bearing a smaller SpongeBob likeness, or laying the original headstones flat on the ground after redesigning the lot. Spring Grove would cover all the costs, Freytag said. Kimberly Walker's twin sister, Kara Walker, said her family went to great lengths for each of the $13,000 headstones, including obtaining copyright approval from Nickelodeon. The family believes the headstone was the only fitting tribute for her sister, a huge SpongeBob fan. Kimberly Walker was an Army corporal assigned to the 2nd General Support Aviation Battalion and served two yearlong tours Iraq in 2006 and 2010 as a petroleum supply specialist, her family said. She was found dead in a hotel room in Colorado Springs in February on Valentine's Day, strangled and beaten to death. Her boyfriend, an Army sergeant stationed nearby, was arrested and charged with her killing. "My sister served our country and most people try to accommodate veterans and try to take care of them," Kara Walker said. "For them not to accommodate and respect what my sister sacrificed, not only for my family, but for everyone else in this country, really bothers me." Freytag said Spring Grove admires and appreciates Kimberly Walker's military service but that the cemetery has to consider the wishes of other families whose loved ones are interred there and may not feel that gravestones modeled after cartoon characters are appropriate. The dispute over the headstones has gained nationwide attention. Freytag said the cemetery has received so many calls, both in support of and against its decision, that they had to set up a special extension to field all the comments.